What's a Grist (Malt) Mill & How Is It Used in Craft Brewing? What is a “grist mill”? Every brewery has one. Sometimes referred to as the “malt mill,” the grist mill breaks apart the malt to expose the starch body of the grain. It does this by running the malt through a set of steel rollers that can be adjusted to achieve the optimum grind of the grist. The grist, as milled malt is called, needs to be of a consistent grind, but barley corns and wheat kernels are not always the same size. Roller settings are adjusted as needed to insure maximum yield in the brewhouse. Earlier grist mills had a single set of rollers, with the settings adjusted manually using a lever-and-gear mechanism. More modern mills have three sets of rollers which are set with a precise electrical motor-and-sensor assembly. 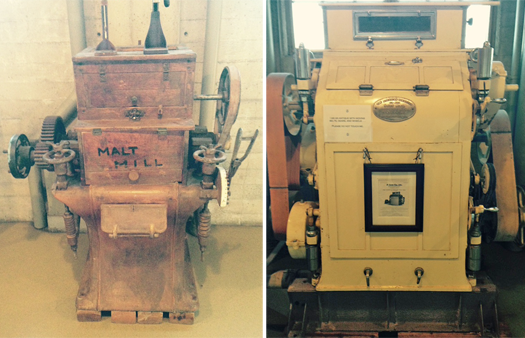 We have three mills at Anchor Brewing: two older models that have been retired and are on display, and one that is currently in use. The two historic mills were designed in the machine age and were powered by a single source which drove all of the mill functions through a series of belts and gears. 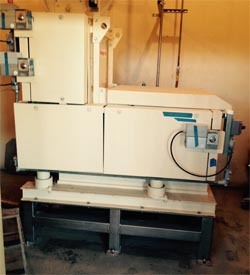 The new mill employs a precise computer and sensor-controlled set of electrical motors that drive the individual internal mechanisms. All three mills are designed to do the same job, with advancing degrees of efficiency. The smaller one (left), with the wooden upper portion, was in use at our old brewery up until we moved to our current location in 1979. We don’t know exactly how old it is but the characteristics of its design date it to late 1800’s and maybe earlier. This amazing antique could have been in service for well over sixty years. The larger mill (right) is of 1930’s design, also maybe earlier. We acquired it as a refurbished unit when we moved our brewery in 1979. In its day it was a popular item. I have seen mills of this type in use all over the country in older breweries and even in some distilleries in Scotland. Although of a later generation than the little guy, it shares the same basic design on a much larger and sturdier level. Its massive construction made it a durable machine, and it was in daily service at Anchor for over thirty years. Our current mill looks nothing like its older brothers but works on the same principle of three sets of adjustable rollers. It’s much more efficient, easier to use, and quieter than the older models and will probably last for thirty years as well. But somehow it’s not quite as cool-looking as those old guys with their leather belts, hand levers, exposed gears, and all that. Thank you for this interesting and fun article Bob. History connects us to each other and everything! Fascinating. It was a pleasure meeting you at the SF Beer Week closing party at Trumer. I look forward to hearing from you soon.